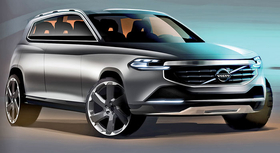 Volvo's XC90 concept points toward a new look for the brand. LOS ANGELES -- Volvo's brand image is stuck somewhere between "premium" and "luxury," but the Swedish automaker aims to move further upscale with a fresh design language and a new generation of vehicles powered by more fuel-efficient engines. New mid-sized and large models will begin arriving in 2014 based on Volvo's lightweight SPA platform. The vehicles will use Volvo's coming generation of smaller four-cylinder engines. Executives say turbocharging and plug-in hybrids will give the vehicles more power even as the automaker phases out its five- and six-cylinder engines. Stefan Jacoby, CEO of Volvo Car Corp., says that with the price of gasoline and coming fuel economy regulations, engine displacement no longer will be linked to luxury -- at least in Volvo's world. Rather, he says, high-tech fuel-saving technology that produces neck-snapping performance will be Volvo's recipe. "The time for counting cylinders is over," Jacoby says. He says a diesel plug-in hybrid in development will achieve an EPA rating of 123 U.S. mpg (1.9 liters per 100km) and have 440 pounds-feet (597 newton meters) of torque. The electric-only mode will have a range of 30 miles (48.3km). Drivers will be able to choose when to activate the EV mode. The powertrain will be shown at January's Detroit auto show. Volvo also is dialing back on electronic control units because Jacoby says they take the driver out of the driving equation. He says Volvo wants more man-machine interface -- other than when active-safety intervention is needed. Executives say they are repositioning the brand since Volvo's acquisition last year by the Chinese carmaker Zhejiang Geely Holding Group. They say Volvo's luxury competitors have made technology -- rather than the customer -- the starting point for vehicle development. 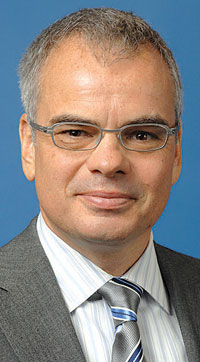 But Volvo will seek customers who desire "cultivated luxury," said Richard Monturo, Volvo's vice president for global marketing. "We will unabashedly be a luxury player all around the world," said Monturo, an American executive, who joined Volvo in February after heading the Miami- and Buenos Aires-based advertising agency La Comunidad. At the agency he worked on campaigns for Nissan, Mercedes-Benz and Volkswagen, among others. "Customers have shown a willingness to pay us more money for our cars," he said. "We will go upmarket if the market will bear it. A lot of our customers are highly affluent but buy a more discreet luxury. For us, the back story behind a product is the status. It's not just 'Look at me.' "
Volvo last week allowed journalists inside the inner sanctum of its styling studio in Camarillo, California. Executives and designers showed renderings of a series of Volvos that will replace the S60 and S80 sedans and the XC90 crossover. Those vehicles -- and other possible derivatives -- will ride on the new SPA technology, which stands for "Scalable Platform Architecture." The automaker claims the new platform, which will handle all of Volvo's mid-sized and large vehicles, weighs 320 pounds (145kg) less than comparable platforms from other manufacturers. The XC90 replacement will arrive in 2014. The design freeze is now six months away. The S80 will be redesigned in 2015. The various exterior shapes being considered suggest a brand still searching for its design language. Some of the renderings evoke the current Maserati Quattroporte, while others suggest the original Volvo Amazon, a mid-sized car that debuted in the mid-1950s. One even paid homage to the teardrop shoulder lines of vintage Talbot Lagos. "We are exploring the full range of possibilities," said Chris Benjamin, design director at the Camarillo studio. "SPA allows us to create more sleek, more luxurious proportions. The focus is not about having a product you use. It is more of an experience." But the broad, rounded shoulders that have been a part of Volvo since the late 1990s will remain. And while there may be some sharp creases and character lines, Volvo will not return to the "brick" look that Volvo 240 traditionalists love. "Design is a subjective thing," Benjamin said. "We are free to do whatever we want." Although the Concept You unveiled at the Frankfurt auto show displayed more streamlined, fluidic styling than current Volvos, Benjamin said Volvo doesn't want to create too slippery a car. He said: "The better the aerodynamics, the worse the car looks."